Members of the Balochistan Cabinet were assigned portfolios on Thursday. According to a notification issued by Chief Secretary Dr Akhtar Nasir, the 10 ministers in Chief Minister Jam Kamal’s cabinet have been given portfolios of ministries, as has one adviser. Mir Mohammad Arif Mohammad Hassani has been given the finance portfolio, Noor Mohammad Dumar public health engineering, Sardar Sarfaraz Chakar Domki culture, tourism and archives and Nawabzada Tariq Magsi communication and works. Zamrak Khan has been made agriculture and cooperatives minister, while Zahoor Ahmed Buledi has been given the information portfolio. 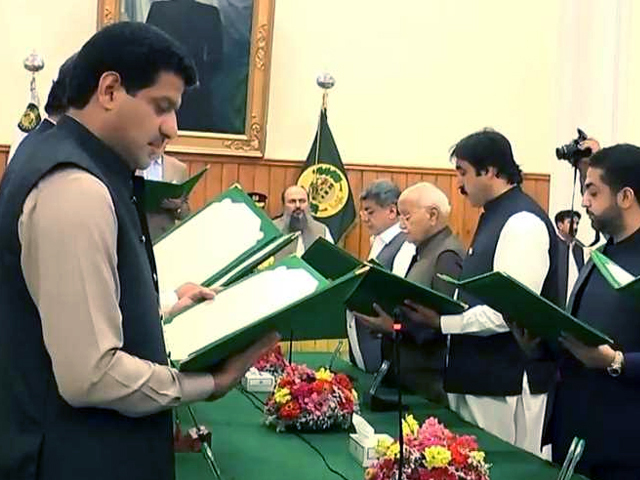 Mir Ziaullah Langov has been made forests and wildlife minister, Mir Naseebullah Marri health minister, Sardar Mohammad Saleh Bhootani food, law and parliamentary affairs minister and Saleem Ahmed Khosa the minister for home and tribal affairs. Mitha Khan Kakar has been made adviser to the chief minister on livestock and dairy development.